Move files quickly and easily with this open-top mobile file. 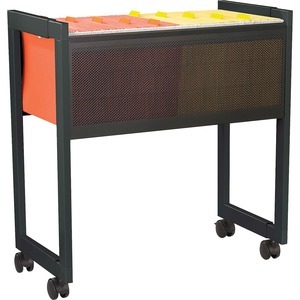 This file includes an adjustable frame to accommodate letter-size or legal-size hanging files for convenient desk-side access. Capacity is approximately 80 hanging files. Weight capacity is 300 lb. Steel construction features a durable powder-coat finish. Adjustable file rolls easily on 2-1/2" diameter, dual-wheel casters (two locking).